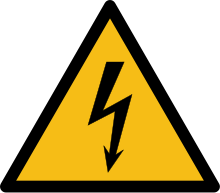 High voltage warning sign image. 当前 2013年8月11日 (日) 14:01 704 × 591（1 KB） Sidpatil Filesize reduced using `scour`. 2009年11月10日 (二) 22:14 704 × 591（3 KB） Sidpatil Trimmed all extra whitespace.